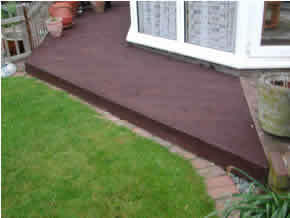 Decking can make an attractive feature to your garden and can complement other features. Decking is a fairly quick way of achieving a level path or patio without having to carry out a massive amount of ground preparation. Generally you can use the same rules for constructing a floor in your house. You will need joist bearers at 400mm centers to support the decking across the main area and at the edge of the decking. Each must be supported at regular intervals by a post to the ground. The diagram below shows the general arrangement. Intermediate joists will also be required at 1000mm intervals to give added support to decking which may be installed at an angle. This will also stop the main joists twisting as the decking is used. A typical layout is indicated below. Decking planks can be installed at an angle to make it look more interesting and prevent people slipping on the surface when wet. Before fixing the decking it is advisable to treat the joists with a wood preservative and also lay a weed quilt under the joists to prevent weeds growing up through the gaps in the decking boards. Decking boards are best fixed down with 70mm screws and each board spaced at about 4mm gap. This spacing tends to increase as the boards shrink with age. When the decking is fixed apply a timber preservative to the finished decking and it will look smart and fully seal any holes made by the screwing down of the boards. Copyright 2008 © 4theUK Ltd. All rights reserved.